The Old Bern Snow Mountain Paradise compounds the urban and alpine landscapes, redefining the ski empire of Switzerland in a warmer world where snow is scarce. Draped over the centre of the city, the Snow Mountain creates a unique skiing experience for both tourists and the inhabitants of Bern. The Mountain is not a solution to the problems facing the entire ski alpine empire, nor is it a replacement for what has been lost. 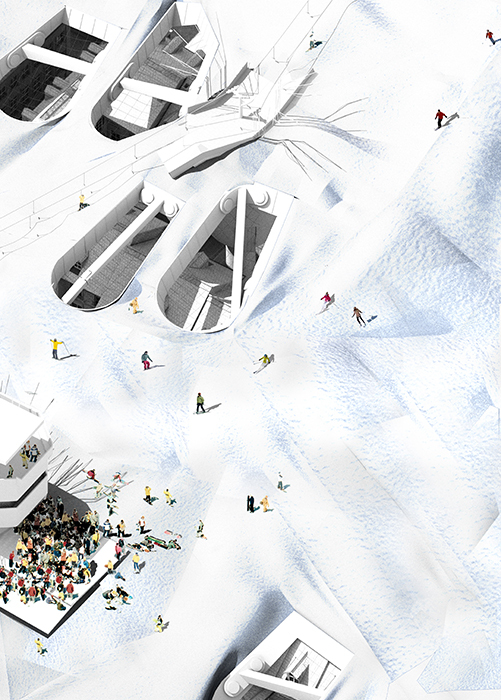 It proposes a new way of building both cities and ski resorts. Through the use of environmental technologies and spatial interventions, the city becomes an ideal place for an artificial snow dependent ski resort to thrive.